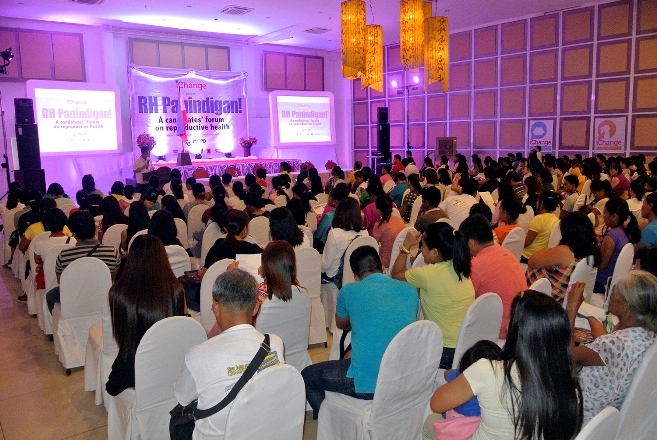 Several groups challenged national and local candidates to ensure the effective implementation of the Reproductive Health Law in a forum celebrating International Women’s Day today in Puerto Princesa City. The Philippine Legislators’ Committee on Population and Development (PLCPD) led the call, urging bets to defend the right of all, especially women, to family planning and reproductive health. “Birth spacing improves maternal health and gives couples elbow room to manage their resources so they could provide their children their basic needs,” Ma. Aurora Quilala, PLCPD communications and research head, said. Ms. Quilala stressed the importance of ensuring availability of and access to family planning information and services and its long-term positive impact on national development. “The enactment of the RH Law, after more than 10 years in the legislative mill, is a huge step in the right direction. However, the constant challenge from anti-RH groups threatens to derail our progress in family planning and maternal health,” she said. “The Senate recently slashed the budget for family planning by P1 billion, delivering a severe blow to efforts to increase contraceptive use that will contribute not only to meeting couples’ fertility goals but also to reducing maternal deaths in the country,” Ms. Quilala lamented. Palawan is among the provinces with the highest maternal mortality ratio (MMR) in the country. According to a report that cited the Provincial Health Office (PHO), Palawan recorded 182 maternal deaths per 100,000 live births in 2014, a huge increase from the 125 MMR in 2012. Nationally, there are 221 maternal deaths per 100,000 live births, according to the 2013 National Demographic and Health Survey. The country failed to meet its Millennium Development Goal (MDG) 5 target of reducing maternal deaths to 52 per 100,000 live births by 2015. “The next set of leaders, both at the national and local levels, should ensure that there is sufficient funding for the implementation of the RH Law, especially family planning,” said Ben de Leon, president of the Forum for Family Planning and Development. “As we celebrate Women’s Day today, we must recognize the critical role women play in society. It is thus important that the government provides women the information and services that would contribute in improving their health and well-being, especially their reproductive health,” he said. “It is also crucial that the youth are provided RH information and services to prevent unplanned pregnancy and sexually-transmitted infections like HIV,” he added. Around 9% of the total maternal deaths in Palawan are among teenage mothers (15-19 years old). Countrywide, teenage pregnancy is on the rise. 14% of Filipino girls aged 15-19 years are either pregnant or already mothers – twice the number in 2002 – based on the 2013 Young Adult Fertility and Sexuality Study. Meanwhile, 28% of new HIV cases in the Philippines from 2011 to 2015 are among young people 15-24 years old. Palawan has the highest number of HIV cases in the MIMAROPA region, according to reports.